What really makes for a great and successful hunt is not only the weather and season, but also the equipment and additional gear you take with you. Clothing is just as important as your weapon of choice, and other additional items you may not think of are also important, such as a flashlight or gloves. One item may stand above the rest in importance, but that doesn’t make any other item unnecessary. Together, they all play a part in making for a successful hunt. There are many different types of hunting gear that you should invest in. Any item, no matter how big or small, can make or break your hunting trip, and they all have their own roles to play to bring you success. Your choice of which weapon to bring with you on a hunting trip is crucial. A rifle should be chosen with an included rifle scope, to help with accuracy as you aim at your target. Crossbows are also great weapons, and the arrows can easily be carried with you in a quiver. The clothes you wear protect you from whatever weather you may experience. Proper boots are essential in order for you to be able to navigate through rough, uneven, and perhaps wet terrain. Gloves are also great to have to keep your hands warm and to prevent your hands from slipping while you handle your weapon. If you find yourself out later than expected and the sun is beginning to set, a flashlight can come in handy. You may want to consider bringing a hunting knife with you as well, in case you need to skin any small target you come across or make a larger target easier to carry once you take it down. With a variety of different hunting gear on the market, it may be overwhelming trying to find the best quality essentials. To make your purchasing easier, we’ve compiled a list of the best deer hunting gear that will have you well-prepared for your next hunting trip. 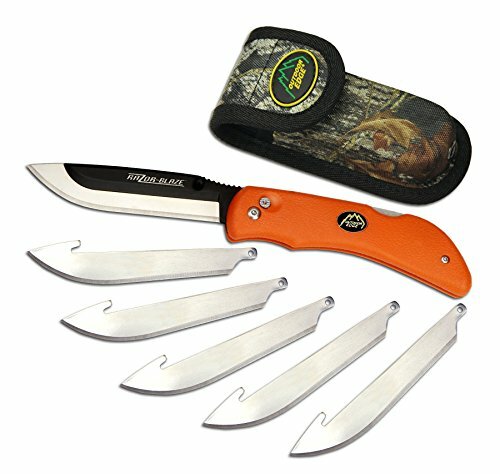 This hunting knife comes with six replaceable blades and features a non-slip rubberized handle to ensure you have a secure grasp on it so no accidents occur. A nylon sheath is included to safely keep your knife stored. Each blade is approximately 3.5 inches long, and the entire knife measures around eight inches altogether. The replaceable blades are easy to remove and attach thanks to the push-button blade system, where you simply need to push the button to release the blade with a fair amount of pressure. Each blade is sharp and made of stainless steel, and with the ease of attaching the blade to the handle, you can be sure to include it on your next hunting trip. Overall, this is a high-quality hunting knife that you can easily carry with you, thanks to the handy and protective sheath it comes with. This knife includes six replacement blades, so you won’t have to worry about buying entirely new knives for your kit. The blades are easy to remove and attach, but some pressure on the button is needed to release the blade, so you won’t have to worry about it just falling out. One thing to keep in mind is that the rubber grip is sometimes hard to get out of the sheath, so be gentle and careful when removing it, since you’re dealing with a very sharp blade. This treestand is designed to support two individuals, with two seats and a weight capacity of 500 pounds. The construction is made of durable and weather resistant steel and features a platform size of 42 inches wide by 34 inches deep. Two full body harnesses are included as an extra safety precaution in case you want to stand and shoot, or if you just want that extra security if you’re sitting. The seats are made with a comfortable flex cushion and include a padded backrest as well so you can comfortably sit for hours while waiting for prey to come into the area you’re staking out. 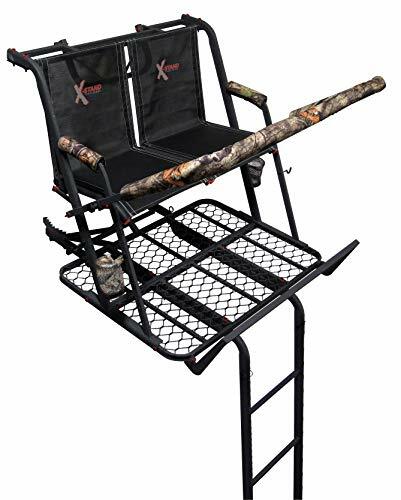 This is a great treestand to buy if you’d like to go hunting with a buddy, since there are two seats and ample platform area for you and a friend to occupy. The seats are cushioned and feature backrests, so you can wait with ease. The ladder makes this stand relatively easy to climb up and get into, but you should be aware of the stand placement, as some adjustments may need to be made to properly attach the stand so it remains stable and secure with two occupants. A shooting rail is added so you can rest your gun while you shoot, or you can flip it up to give yourself more standing room on the platform. There are two full-body harnesses included so you can safely stand without worry while high up in the trees. 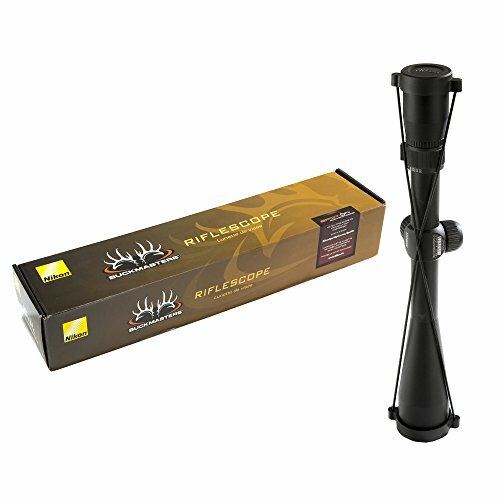 This scope provides crystal clear and bright viewing, enabling you to see high-resolution images while hunting in various conditions. The fully multi-coated lens offers an increase in light transmission to get you the perfect brightness so you can make an accurate shot. A versatile magnification range allows you to be flexible with different hunting locations, from open fields to enclosed forests. This scope is shockproof, waterproof, and fog proof, so you won’t have to worry about any water-based damage that could occur in a different product. This scope is able to effectively bring targets closer and allow them to become clearer, giving you a better view to make a clean shot. This is a great rifle scope to help you better see your target for a cleaner and more accurate shot. It is on the heavier side, but once you get used to the added weight, carrying it will be a breeze. The scope is very easy to use and helps enhance images, bringing them closer and making them clearer. The multi-coated lens helps enhance brightness in various conditions, giving you a better view. It is shockproof, fog proof, and waterproof, so you won’t have to worry about weather conditions bringing any damage to it while it’s in use. The magnification range allows for you to be flexible with different hunting locations, whether in a forest with heavy timber or in an open field. This is a great scope to include on your next hunting trip and will help your shots become more accurate, and help you better locate prey. These boots are made of leather and fabric materials and include a durable, comfortable rubber sole that allows you to walk on various rough terrain. The dual-textured boots come in a leather and camouflage pattern, with the fabric featuring speed lacing and eyelets on the notched shaft. This boot has 1200 grams of insulation and is waterproof, so your feet will remain dry, protected, and warm throughout wear time. They fit wide fit along with narrow feet and are a heavy and sturdy pair of boots that can handle the wear and tear that will occur over time. These are great boots to pair with thick wool socks for extra warmth. Your feet will surely thank you when they’re exposed to cold temperatures. 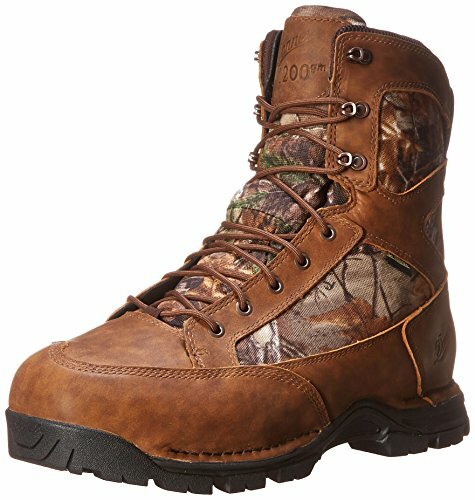 These are a great pair of hunting boots to invest in, especially if you plan on a hunting trip during frigid temperatures where snow and ice may occur. These boots are very durable, comfortable, and are waterproof with insulation, making them perfect to wear during those colder months. They do run a bit large and are on the bulky and heavier side, so you may want to size down. The bulkiness contributes to how durable and rugged these boots are, able to withstand inevitable wear and tear with constant and consistent use. The rugged rubber sole allows you to travel over various rough terrain, while your feet remain dry, comfortable, protected, and warm. This is a great pair of boots that you may want to add to your collection, and paired with some warm wool socks, your feet will be able to handle the most frigid weather. This flashlight features super bright 300 lumen LEDs and can produce light up to 600 feet. It has high, low, and strobe modes for adjustable use in different light settings, so you can be well prepared at any time. This flashlight can run off a single AA battery, or off of a rechargeable one. A heavy-duty build makes this a great, durable flashlight that can handle drops and tough love, and is compact enough so you can easily squeeze it in your hunting pack, no problem. Though small in size, this light packs a punch, and the level of focus of the light beam can be adjusted as well, so you can have a smaller beam that is brighter and more narrow if you so choose. This is a great flashlight, small in size but provides a strong and powerful light. Like many other flashlights, you’ll have to go through the three different modes to get to the one you want, not a big downside though! This flashlight comes at a great price and you only need a single AA battery, or a rechargeable battery, to power it. It is quite durable and also compact, so you won’t have to worry about it becoming damaged if you shove it at the bottom of your bag. This is a great little flashlight that would make a perfect addition to your next hunting trip. These gloves come in a variety of sizes, so there will be a pair that best fits you. 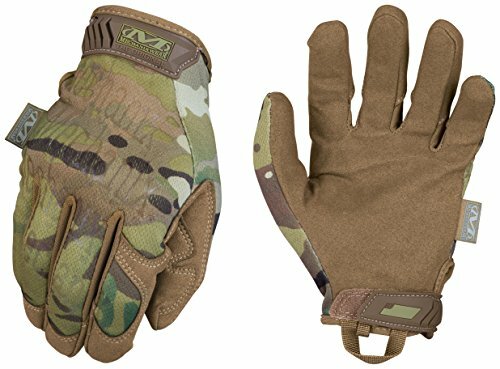 They feature a form-fitting TrekDry material with camouflage design to keep your hands both cool, comfortable, and protected. A secure fit is supported by the Thermal Plastic Rubber hook and loop closure, ensuring that the gloves are comfortable and stay on your hands. The seamless single layer palm provides optimal dexterity and a nylon web loop provides you with a convenient method of glove storage. The synthetic leather palm material also provides a great grip for you to grasp items with, so you won’t have to worry about your hands slipping if it’s raining. This is a good pair of durable gloves that come at a decent price and in a variety of sizes to choose from. If you find yourself being between sizes, you could go for the smaller of the two, and as you wear them they will eventually stretch and fit to be more comfortable. One thing that could be an issue with these gloves is that the closure is on the inside of the wrist rather than the outside, so if the glove were to become loose, the strap could interfere with something you’re wanting to grab. Make sure your glove is properly secured to prevent any issues or discomfort. These gloves have a synthetic leather palm that allows for you to have a good grip on items, and the material is durable, making these a pair worth investing in. This backpack is perfect for your next hunting trip. The front shelf pocket allows you to organize items, and to keep important gear, such as a knife or flashlight, at your fingertips. The drop-down rifle/bow holder allows you to carry your weapons on your back as well, keeping everything in one place and leaving your hands free if needed. There are also quiver holders, a hydration pocket, and a port, so all your essentials will be easily accessible. A padded waist belt includes two pockets, and reinforced webbing can accommodate clip style holsters if needed. The waist belt can aid in securing the backpack to your body and the straps won’t dig in thanks to the padded material. A blaze orange rain cover is included, so your backpack, along with your gear, stays dry and protected from any inclement weather. 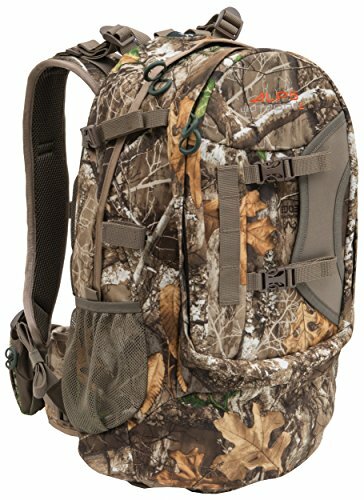 Overall, this is a great medium-sized backpack for a hunter to bring on their next trip. It is not too big and not too small. The material is durable and sturdy, and the backpack comes with many pockets for organization purposes and easy access to gear. A waist belt can be used to securely attach the backpack, or if you prefer to not use the waist belt, it is also removable. As expected of a backpack, you’ll have to make some strap adjustments before you find the proper fit for yourself. In case the weather is not looking the best that day, a rain cover is included, so your backpack and the gear it’s carrying will remain dry and protected. 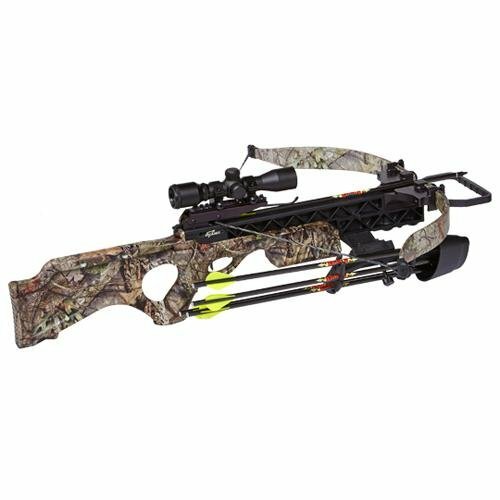 This is a great recurve crossbow that has a draw weight of 200 pounds, a mass weight of 5.5 pounds, and an arrow weight minimum of 350 grams. This is quite a compact and lightweight crossbow, making it great for experienced users or someone new to using a crossbow. It is well-built, making it sturdy and durable to perform all the hunting tasks you need. It performs accurate shots and can sit nicely and comfortably on the shoulder when in use. The attached scope also ensures an accurate aim, so you’ll be sure to hit your target right on. This is a great recurve crossbow to invest in and whether you’re a new or experienced user, it will make a great addition for your next hunting trip. This crossbow is quite light and features a compact and durable build, making it easy to carry around and use. The Vari-zone scope allows you to aim for a more accurate shot, and this crossbow rests well on the shoulder if you need more support when you hold it up to take aim. The draw weight is not excessive, making it a good fit for users young and old. It is easy to draw back and shoots easily and smoothly, making for a great experience. This crossbow only seems to have great qualities to it and it really delivers, so it’s worth investing the money and time in. This rifle features an adjustable trigger, a hammer forged barrel, and a recoil pad to ensure that you’re completely comfortable and confident in your shot. This also ensures that after you’ve made a shot, the recoil doesn’t harm you in any way, if you are unprepared for it. It also features a lightweight stock, a full diameter bolt, power bedding, tang safety, and rotary magazine. Though this is a lightweight rifle, so you don’t have to be concerned with the kickback. It performs just as well as a higher priced rifle and makes for a great hunting experience. 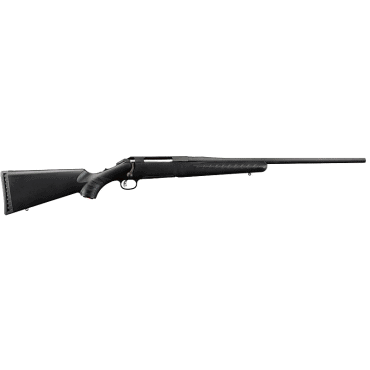 This is a great hunting rifle to invest in. Not only is it lightweight and durable, but the features make for a great hunting experience. Since it is so lightweight, it can be carried around for hours on end with ease. The short throw bolt is both strong and smooth and has three locking lugs. The trigger is clean and crisp and has no take up. The accuracy of this rifle is also nothing to look down upon since it is able to fire a great distance while maintaining accuracy. This is a reliable, accurate, high-quality, and affordable rifle worth investing in. 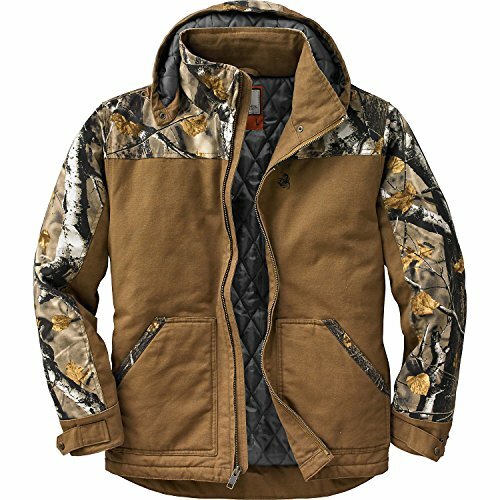 This jacket comes in a variety of sizes and colors, ranging from black to shades of brown. It is made with a shell of 100 percent cotton and a lining and fill which are both of 100 percent polyester. The heavy-duty ten-ounce sanded canvas material helps protect you from bushes, branches, and any obstacles that may scrape by you as you trudge through a forest, and the material is more difficult to rip and wear down because of its durability. This jacket features 210 grams of insulation to keep you protected and warm from wind, ice, snow, and the decrease in temperatures that occur as the sun sets. A heavy-duty zipper allows you to secure yourself in the jacket, without worry of the zipper breaking like the flimsy types do. A hood adds protection to your face and head and can be easily removed by a zipper if you decide you don’t want to include the hood one day. Double interior pockets are included, in which you can store important items for easy accessibility and protection. This is a pretty good jacket, taking into account the price and what it has to offer. The jacket does seem to run a tad big, but that works well with layering if you’d like to stick to your usual size. The material is quite durable and seems to hold up against damage that occurs when brushing by bushes or thorns. Also, it is relatively water-resistant, but that doesn’t mean you can be in a downpour with it and remain dry. Interior pockets keep items safe and close to your body so you won’t have to worry about losing them, and it also makes them more easily accessible. Insulation is provided to help keep you warm in those colder temperatures and a hood is included to add extra weather protection. The hood can conveniently be removed if you’d prefer to not wear it as well. This is a great jacket to add to your collection, and it is worth investing in. It’s always exciting to add new gear to your collection, to help enhance your hunting experience and provide for a quality hunt. There are some things you may want to keep in mind before you go off and find new gear, and we’ve listed a few to consider below. If you’re going to be purchasing new hunting gear, you’ll want it to be made of quality and durable materials so it won’t need replacement any time soon. To help provide a successful hunting trip, you don’t want your gear to give up on you halfway through, so look for items that can withstand weather and are able to hold up against rough treatment as you travel. A weak spot in any item that contributes to a hunting trip could risk the hunt itself, so eliminate weak items and find reliable ones. Cost of an item can be an interesting topic. Of course, you would like high-quality gear that performs as it should be based on the price, but the thing is, more isn’t always the best. Less can be more. There are many high-quality items on the market today that can perform just as well as an item at a higher price point could, however, it wouldn’t be breaking the bank. Think of how many items you need as well. If you try and buy multiple expensive items believing that the price speaks for the quality, the bill piles up. On a hunting trip, you’re likely to be packed to the brim with necessary items that will come in handy on the way. In order to reduce the load you have to carry, you should consider items that are easy to pack and that are lightweight along with durable. It is important to consider the weight that each item will contribute, and how it all stacks up when it’s packed together. There are plenty of items that can be found as a more lightweight model, so take that into consideration. Your gear is what really makes or breaks a hunting trip; it helps to perform the tasks needed while also getting you safely through the outdoor environment. Each item is just as important as the next, and though it’s better to pack lightly so you have less to carry, it never hurts to be prepared for any situation. Essentials include proper clothing, a backpack, flashlight, hunting weapon, etc. Take the importance of each item into consideration, and see if they meet the standards that you’d like them to. For deer, especially mature bucks, making mistakes is simply inexcusable. They constantly fight for survival. They fight the elements during extreme weather. They fight each other for dominance during the rut. There are a host of wild predators looking for every opportunity to take an easy meal. And of course, humans are the most efficient predator of whitetail deer. With all the odds against them, deer can’t afford to make mistakes. That’s why trophy bucks are rare. It’s difficult to dodge all of those obstacles when one misstep can lead to demise. Thankfully for us and them, deer are well equipped to elude danger. As hunters, our mistakes can be life and death too. We carry lethal weapons, climb high into trees, and often exert ourselves more than any other time during the year. Fortunately, other than a handful of tragic cases, the vast majority of our mistakes only lead to a hunt without harvest. For most of us, an unfilled tag just means we’ll be eating chicken instead of backstraps in camp. We’re there for the camaraderie, a connection to nature, and the thrill of having an opportunity to bag a deer. Our mistakes in the field are really not as high stakes as those in nature. But avoiding simple mistakes can make your time in the field more enjoyable. Here are four gear related deer hunting mistakes to avoid. There are lots of places to shoot shotguns & bows, but the loud bark of a rifle and it’s long reach limit the amount of times most hunters fire their rifle. Preseason sighting is imperative and is a given. But I like to take my preseason shooting sessions a bit further. Shooting from a bench is a great way to zero in a gun. But very few of us hunt in a situation like that. After zeroing in a weapon, stand up and take a few shots leaning up against a post. Use your sling for a few shots. Practice shooting in a situation you anticipate hunting in. Most hunters can’t consistently shoot well at more than one hundred yards without sticks. Many of them need to see this for themselves before trying it in the field. That’s what this “practice” session is for. Another good thing to rehearse that many people overlook is using the safety. I often hunt in close quarters. Many of the deer I have taken with a rifle were well within bow range. Working the safety quietly and without looking down is necessary to avoid detection. You can practice this one in your living room. Good binoculars are literally worth their weight in gold to an outdoorsman. While I can not attest to the advantage of super premium binoculars because I have never used them, I do know the difference between cheap binoculars and very good ones. I started my hunting adventures with a pair of inexpensive hand me down binoculars. They fogged up, were difficult to focus, and due to their design, were hard to look through. When I began hunting seriously, I made what has become one of the best purchases of my life. My Nikon Action EX 12x50’s set me back about $175. But they have more than paid for themselves. They are waterproof, never fog up, easy to focus, and offer great field of vision. They are in my truck throughout the season and are used for scouting deer, ducks, and turkeys in a wide variety of settings. You can spend more to get a premium quality pair, but in my opinion these binoculars offer everything you need at a great value. I do much of my hunting from the forest floor. I enjoy being at the same level as my quarry. It’s face to face. Mistakes are more pronounced. It’s fun! But there are times when being up in a tree is the only way to go. Having the right tree stand for your application is the difference between an enjoyable hunt and being miserable. If you primarily hunt public land, a climbing stand may be the best choice. If you don’t like climbing up small foot pedals in the dark, a ladder stand is the choice for you. Think about the kind of hunting you do. If you are hunting with a gun, a front hand rail is beneficial. It would be in the way of a bow hunter. Take a look at the platform. Is there enough room to turn your body for awkward shots? Is the seat wide enough for a long day on stand? Don’t buy a stand simply for price. And don’t forget a quality fall arrest system. Your children, spouse, employer, and the government depend on you. Some people swear by their GPS. If you hunt large tracts of land, a GPS can be an invaluable tool. 90% of my hunts are done in farmland areas with plenty of landmarks and quick access to tractor paths and roadways. Getting lost in this situation is nearly impossible. I also hunt national forests and get out to the massive, wild expanses of the Rockies when I can. Not too long ago, I carried a compass. But these days a GPS is the way to go. A few years ago, I hiked a few miles deep into the Chequamegon National Forest to hunt a mostly untouched area of the forest. When I felt assured that I was far enough in to avoid seeing another hunter, I set my stand. An hour later, the sun began to crest the eastern sky. Then I heard the sound of hounds getting closer. The truck they were riding in passed by my stand less than 100 yards away. Yes, I was a few miles from my vehicle, but just a short walk from another logging road. GPS, my friends… the wave of the present and the future.